Last major update issued on March 25, 2008 at 04:45 UTC. The geomagnetic field was quiet on March 24. Solar wind speed ranged between 386 and 455 km/s. Solar flux measured at 20h UTC on 2.8 GHz was 79.4. The planetary A index was 4 (STAR Ap - based on the mean of three hour interval ap indices: 3.9). Three hour interval K indices: 11101111 (planetary), 02112201 (Boulder). Region 10987 developed quickly and could produce occasional C class flares. 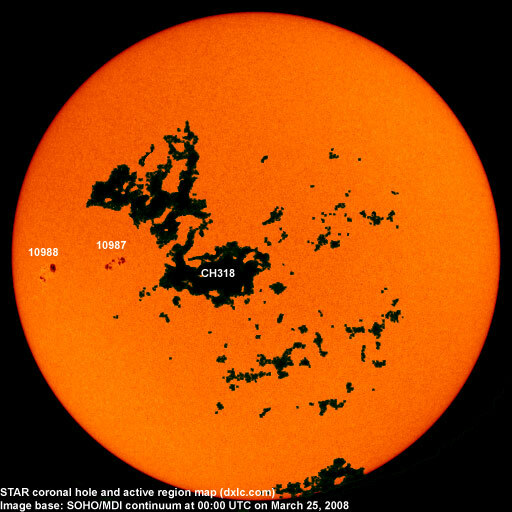 New region 10988 emerged near the southeast limb on March 23 and was numbered the next day by NOAA/SWPC. The region developed quickly on March 24. Another active region is about to rotaate into view at the southeast limb and should be in view late on March 25. 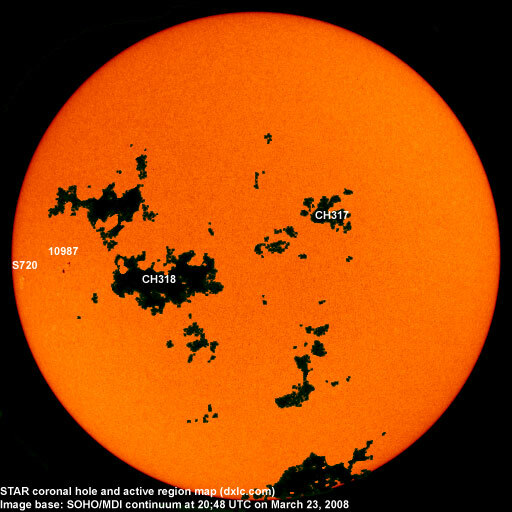 March 22-24: No partially or fully Earth directed CMEs were observed. Processed SOHO/EIT 195 image at 00:24 UTC on March 25. The darkest areas on the solar disk are likely coronal holes. 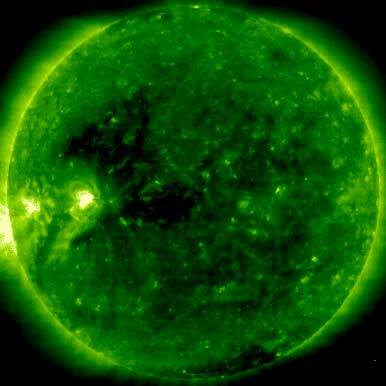 The geomagnetic field is expected to be mostly quiet on March 25. Some unsettled and active intervals are possible on March 26-27 due to effects from CH317 while a high speed stream from CH318 could cause quiet to active conditions on March 28-31. There is a chance of minor storm intervals, particularly on March 28-29.